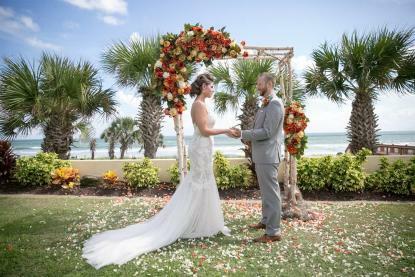 Set on a pristine stretch of cinnamon sand beach, Hammock Beach Resort in Palm Coast is the place for a dreamy destination wedding. Its gorgeous ocean views and luxurious amenities only add to your special day. Here are the top reasons to have your wedding at Hammock Beach Resort. The Atlantic Ocean provides the backdrop for your fairy-tale wedding. Whether you want a mellow and intimate wedding or a grand and chic one, Hammock Beach Resort has a venue that fits your theme and size. 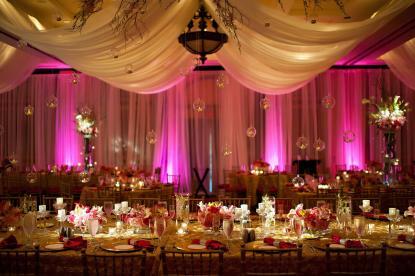 The luxury resort has more than 75,000 square feet of beautiful indoor and outdoor event space. Your guests will love mixing and mingling during the cocktail reception at the courtyard or the clubhouse, which both have scenic spots. And saying your vows overlooking the ocean, Intracoastal Waterway or the lush greenery of the golf course is a picture-perfect moment. After the I do’s, enjoy your first dance in one of the two exquisite ballrooms. Hammock Beach is truly an all-in-one wedding destination—from the rehearsal dinner to the day-after brunch, the resort can host it all. Leave the stress of wedding planning to the team at Hammock Beach Resort, who will make sure your day is as perfect as you have imagined. From flowers to the cake, makeup artists to musicians, photographers to the officiant, the number of decisions can feel overwhelming. Hammock Beach’s event and catering staff have experience working with the area’s top vendors and will help you select the best for your ceremony and reception. Choosing your food will also be a breeze thanks to its several extensive menu packages. On the day of your wedding, you’ll have an on-site coordinator to take care of any last minute details and make sure everything runs smoothly. For your guests, coordinating travel plans couldn’t be easier. With more than 300 rooms, suites and villas, the resort has plenty of rooms for your family and friends. Guests can choose from a variety of upscale accommodations at the resort, including one-, two- and three-bedroom suites that all include living space and an open-air covered balcony. 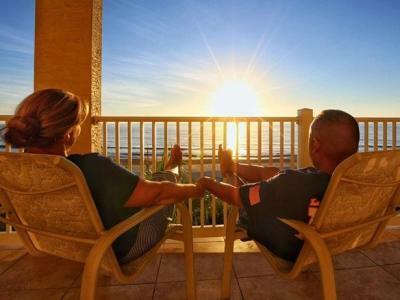 The Lodge at Hammock Beach is an oceanfront boutique hotel steps from the Atlantic Ocean, where guests will fall in love with the scenic vistas of the coastline from the private balconies. During their stay, they will also enjoy all the activities and amenities of the resort plus shore-to-table dining at casual and formal restaurants, such as Atlantic Grille and Sushi Bar. Your wedding at Hammock Beach Resort is one they will look forward to celebrating. Swim, hit the links or relax on the beach—there’s so much to do at Hammock Beach. A highlight of any visit to the resort is the Water Pavilion, which has an upper and lower level pools, a zero entry beach pool, spiral water slide and a lazy river. Drinks and food are served poolside, and the resort’s restaurants are steps away. 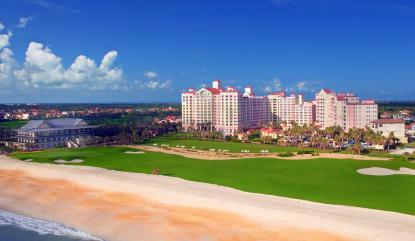 Hammock Beach is paradise for golfers with its two award-winning golf courses: Ocean Course and Conservatory Course. In fact, the resort was named one of Golf Digest’s “Best Golf Resorts in Florida” in 2018. The Jack Nicklaus-designed Ocean Course has six holes right on the ocean. Guests of all ages can hone their skills or play for fun at the nine-hole putting green. The Spa at Hammock Beach provides the ultimate service in pampering with massages, skin treatments and nail services. The fitness center has state-of-the-art equipment as well as spinning, aerobics, yoga and Pilates classes. If you or your guests want to explore beyond the resort, you all are minutes from everything Palm Coast and the Flagler Beaches have to offer, from outdoor activities and the arts to shopping and restaurants. There’s no need to go anywhere else. The complimentary wedding night accommodations are included when you have your wedding at the resort, and Hammock Beach has all you could want for a romantic and relaxing honeymoon. Schedule a couples massage at the spa, take a dip in the adults-only pool, enjoy a special tasting menu at the Atlantic Grille or get hands-on with a sushi rolling class. And when it’s time to celebrate your anniversary, your paradise in Palm Coast will welcome you back. Stay true to your heart with a wedding at Hammock Beach Resort and you’ll have memories to treasure for a lifetime.